The FDA is cracking down on supplement makers, warning them to stop falsely marketing their products as a cure for serious diseases like Alzheimer's, diabetes and cancer. (WXYZ) — The FDA is cracking down on supplement makers, warning them to stop falsely marketing their products as a cure for serious diseases like Alzheimer's, diabetes and cancer. What types of products are being flagged? This is good news because people should not be misled with bogus claims. Many of these companies are preying on people’s fear. As of right now, there are no dietary supplements out there, that can prevent, treat or cure serious diseases like Alzheimer’s. Now what the FDA did, was to send over a dozen warning and advisory letters to companies that have allegedly promoted unapproved and misleading claims about their products. 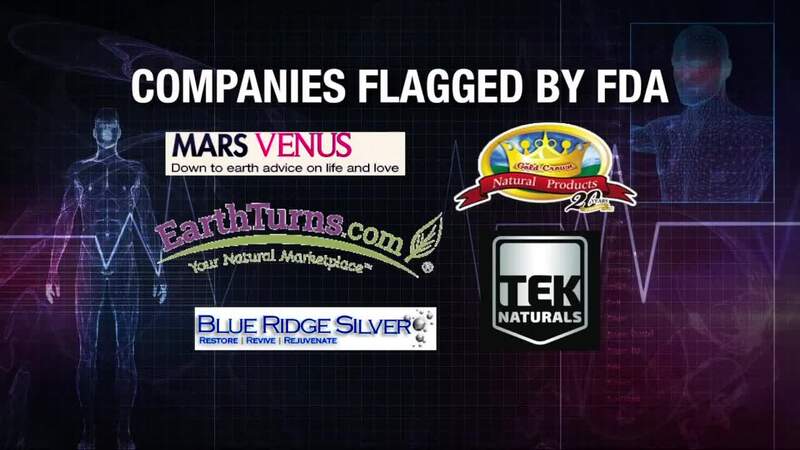 Some of these you may be familiar with, like Earth Turns, TEK Naturals, Blue Ridge Silver, John Gray's Mars Venus, and Gold Crown Natural Products. They are makers of products like green tea extract, fish oil supplements, melatonin and bovine colostrum. Is there any harm in taking these supplements? It’s possible you could take these supplements and nothing bad might happen. But the reverse is also true, something bad could happen. It’s also possible ingredients could interact poorly with medications you may be taking, possibly interfering with them or causing a negative outcome. Another major concern is that folks will choose these supposed miracle cures over FDA-approved medical products that not only have scientific research behind them, but have also been shown to be safe and effective. 1. Be very careful if you shop on the internet. This is where the majority of products with false hope claims are sold. 2. Just because the product says it’s “clinically proven” or it’s a “scientific breakthrough” does not mean it’s legit. These companies know there are folks out there, really hoping for a miracle cure. 3. Remember the old saying, “If it’s too good to be true, it probably is”. But if you decide it really sounds amazing and want to try it, please talk to your health care provider first. 4. Lastly, there are reputable sources and organizations online that provide reliable information to help educate the general public. So please do your research first, before falling prey to these unproven claims.